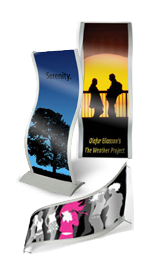 Leaflet stands are constructed from brushed aluminum and have a alluring, smooth silver finish for supplemental appeal. When used indoors, these curved fixtures are resistant to rust! 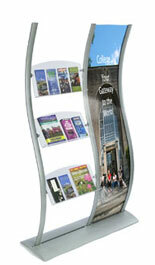 The brochure holders, leaflet stands combine a large poster frame with a floor-standing literature rack to create an undeniably eye-catching fixture. 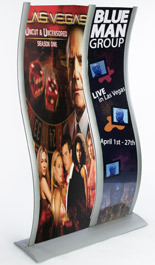 These leaflet stands, such as our other wavy display units, are optimal fixtures for retail stores, lobbies and entryways. The brochure racks, leaflet stands feature adjustable brackets to alter the height, orientation and angle of each acrylic compartment. 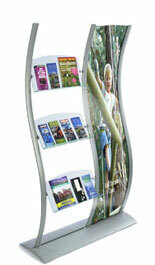 Visitors are able to see your display and view your literature from any direction. These retail fixtures are also doubled-sided leaflet stands! 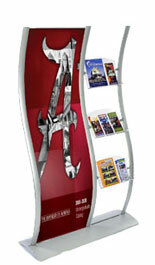 We provide your leaflet stands with (2) clear, plastic lenses to protect your graphics and keep them in place. Leaflet stands, also known as marketing units, feature acrylic compartments to organize and disperse promotional materials and brochures. 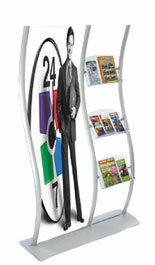 We offer these leaflet stands with either clear or green-edged acrylic compartments. Clear acrylic is a neutral way to showcase headlines and advertisements appearing on your pamphlets, while a green edge adds a bit more style. These leaflet stands cannot be ignored! In addition to these double-wide literature holders, we also offer a variety of floor-standing waves, including large-format poster frames. Displays2Go has thousands of POP presentational fixtures available online. Start shopping for POP displays now and benefit from same-day shipping!